Early bird discount – no administration fee! Book your unit for 2019/20 and save 60€ of administration fee. Nearly Each room has its own balcony, loggia or terrace, if not – less rent! My own little paradise! This is your own apartment with a bed- and/or living room. The modern college home – for you and your old or new friend. This is your own apartment - very spacious and with a huge double bed. It can therefore be perfectly used by 2 people, allowing you to reduce your costs per person. Not only are sport and relaxation close by, also Uni is not too far away. 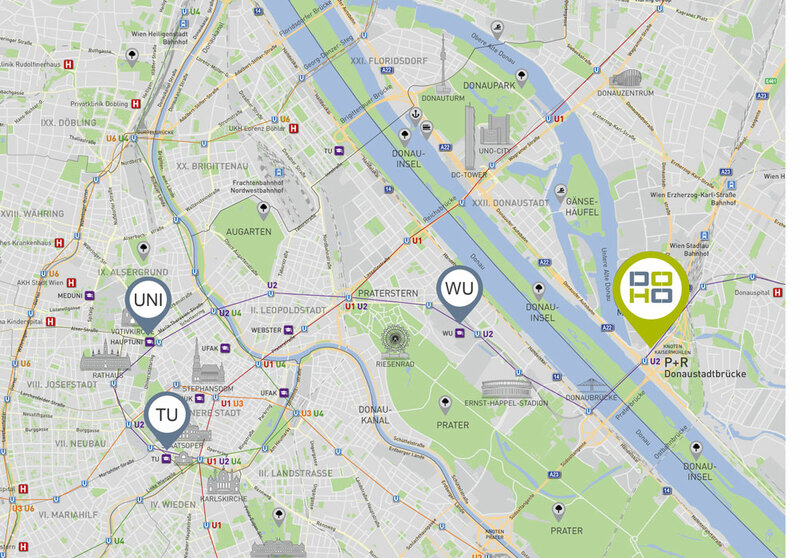 Within a few minutes, you can reach most Viennese Unis via the subway line U2. WU, TU and Hauptuni are even directly reachable without having to change line. In addition, your workspace at the Business Quartier is easily reachable within minutes.